The liver is one of the most important of all our vital organs. The liver is responsible for filtering and detoxifying environmental toxins and pathogenic organisms. Unlike many organs a failing liver is unable to be surgically fixed or replaced. In this article, you will discover 4 ways to improve your liver health naturally. The liver is a vital digestive organ that converts nutrients from the food we eat into essential blood components. It helps to store vitamins and minerals and produces key proteins and enzymes that maintain hormonal balance in the body. The liver helps the immune system fight infections and removes microorganisms from the blood stream. It also produces bile which is essential for digesting fats in our diet (1). The most harmful things for liver health include environmental toxins, infectious organisms, alcohol and poor diet. 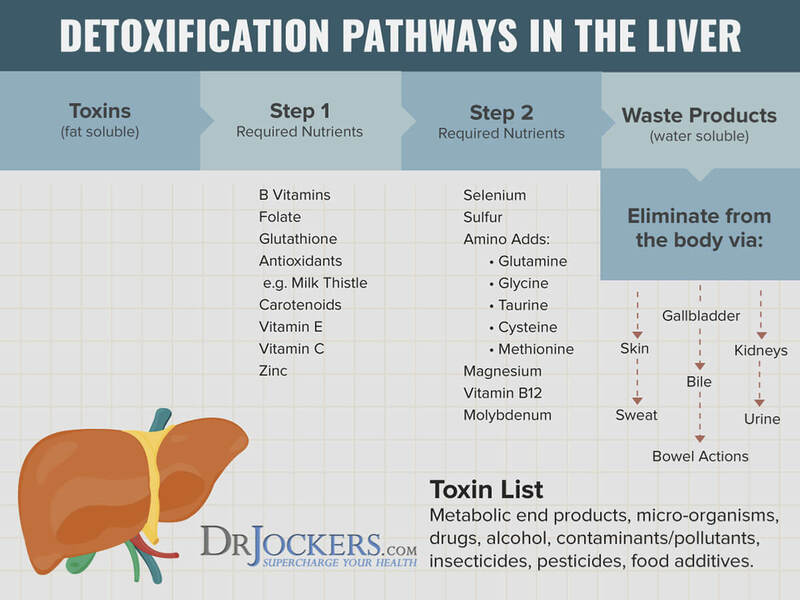 Exposure to environmental toxins and chemicals can backlog the liver as it tries to neutralize and deactivate these poisonous molecules. These chemicals include xylene, benzene, disinfectant byproducts, heavy metals, pesticides and cigarette smoke (2). Infectious organisms are a major cause of liver stress and inflammation. The most well-known organisms are the hepatitis viruses with the hepatitis B & C viruses being the most dangerous. Any sort of chronic infection in the body such as lyme, influenza, aflatoxin and other mycotoxins, etc. have the ability to inflame and damage the liver as well (3). Alcohol and poor diet damage the liver as well. Alcohol must go through the liver’s detoxification cycle to be metabolized and deactivated in the body. Chronic alcohol consumption depletes the liver of valuable glutathione, sulfur compounds and methylating elements such as zinc, riboflavin, B6, folate and B12 (4). Poor blood sugar signaling and a diet high in processed foods that contain toxic additives, preservatives, pesticides, GMO’s, etc. drain the liver of valuable glutathione, sulfur compounds and methylating elements. Often times, individuals that consume a diet high in alcohol and processed foods are not consuming the key nutrients they need to produce glutathione, sulfotransferases and methylating agents. Foods that are challenging for the liver should be eliminated. This includes processed and refined foods and common food sensitivities such as gluten, soy, peanuts, pasteurized dairy and corn. Foods that are high in mycotoxins must be minimized as well. This would include most legumes and nuts which should only be consumed in small moderation. Be sure to get your organic, mold-free coffee and raw cacao and refrigerate it to prevent mycotoxin formation (5). Anyone with liver challenges should be vigilent about using only certified organic, chemical free products. This includes all food choices, personal hygiene products and household cleaning agents. Reducing toxin exposure from the environment including water and air filtration is very important. 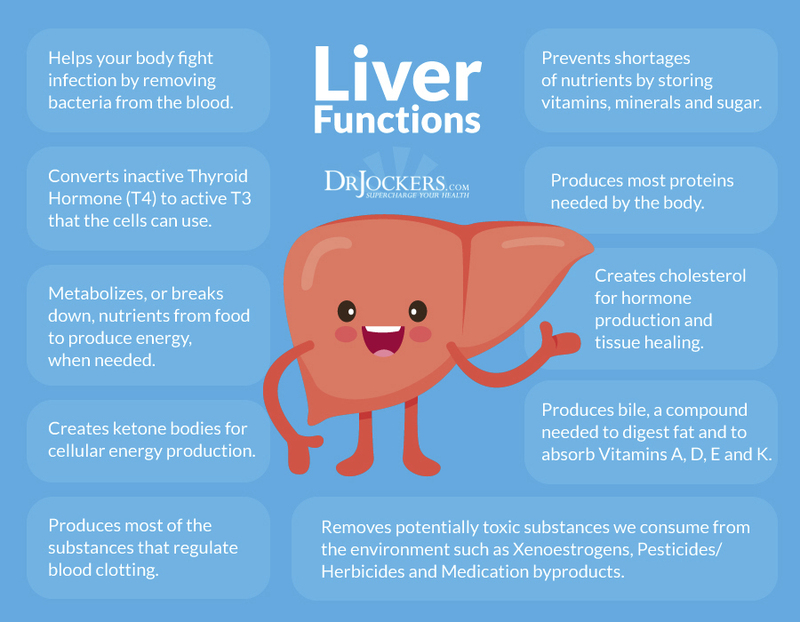 A lifestyle that supports liver detoxification includes reducing toxic exposure while simultaneously enhancing immunity, rebuilding glutathione levels, sulfur compounds and methylation. We use the phrase, “Bitter is good for the liver,” to help us remember that bitter herbs are especially good for the liver and the bodies detoxification process. Using detoxification techniques such as Epsom salt baths, coffee enemas, oil pulling, dry brushing, intermittent fasting, water flushing & infrared sauna are especially helpful for strengthening the liver. These should be done whenever possible along with consuming liver healthy foods. Some of the best liver benefiting foods include those that are rich in B vitamins, vitamin C and trace minerals. This would include lots of raw veggies like celery, spinach, cucumbers and romaine lettuce and steamed veggies such as the cruciferous family. It is also especially advisable to juice your veggies to better absorb the nutrients. Citrus fruit and berries are especially good for the liver. Using herbs such as ginger, milk thistle, cilantro, watercress, wormwood, mint, horseradish, sorrel, radish, peppermint, parsley, dandelion, coriander, garlic and turmeric are especially good for liver health. A great juicing recipe for liver and kidney health is spinach, celery, cucumber, lemon and ginger. Another favorite is kale, cucumber, parsley, celery and lime. Eating liver from an organic, pasture-raised animal provides powerful nutritional support for liver health. This would include grass-fed beef liver, fish liver, wild-game liver or pasture-raised chicken liver. Pasture-raised eggs are also an incredible source of liver supportive nutrients such as sulfur compounds, methylating elements and glutathione precursers. This is the Cytochrome P450 enzyme phase that transforms the toxins into a chemical form for further metabolism in phase II. These P450 enzymes depend upon amino acids, vitamin A, B2, B3, C, E, folate, iron, calcium, copper, zinc, magnesium & selenium. Deficiencies in these nutrients slow the transformation of specific toxins. The top threats to these deficiencies include blood sugar imbalances, a deficient diet and poor gut function that hampers nutrient absorption (6). The best foods for these key nutrients include dark green leafy veggies, citrus fruits, berries, carrots and organic nuts & seeds such as Brazil nuts, almonds, pecans, pumpkin seeds, hemp seeds and chia seeds among other things. Consuming pastured eggs and liver from pasture-raised animals are a fantastic source of many of these key nutrients. Phase II liver support is when the various toxins are conjugated into water soluble forms. The conjugation reactions involve multiple pathways. The key nutrients needed to boost phase II liver detoxification include methylating agents, glutathione and sulfur compounds (7). Methylation depends upon high levels of vitamin B2, B3, B6, Folate and B12 as well as trimethylglycine and choline. We get these nutrients from dark-green leafy veggies, organ meats and pasture-raised eggs among other sources. Glutathione boosting agents include milk thistle, turmeric, non-denatured whey protein, pasture-raised eggs, onions and cruciferous veggies. Sulfur compounds such as cysteine and methionine are found in onions, garlic, pasture-raised eggs and cruciferous veggies. This process transports the transformed, conjugated toxins out of the cells and into a shuttle to get it into the urine or bile for excretion. This depends upon enzymes that are formed from nutrients we described above. Additional support comes from nutrients that improve bile flow, blood purification and soluble fiber sources. Bile Flow support comes from ginger, yarrow, artichoke, dandelion, cumin & fennel. Blood purification comes from chlorophyll rich foods such as wheat grass, oat grass, chlorella and spirulina along with regular consumption of dark, green leafy veggies. Soluble fiber sources such as chia, flax, hemp and pumpkin seeds are a tremendous help to the liver detoxification process. These fibers bind up the excreted bile and deactivated toxins. Insoluble fiber sources such as fruit and veggies help to sweep fiber/bile/toxin compounds out of the system through the bowels. It is key to begin your approach to supporting liver health through diet, lifestyle and advanced strategies such as juicing. The next step is to add in targeted supplements. Here are my favorite for liver support. I often recommend one or more for my clients depending upon their health history, symptoms, health goals, lab testing and other factors. This is the supplement that I use to reduce anti-body formation to the thyroid and support T4-T3 conversion by improving liver function. This contains high levels of selenomethionine which is key for phase I liver detox and it has alpha lipoic acid and N-acetyl cysteine which boost glutathione and support phase II liver detox. This product also contains milk thistle which helps to heal damaged liver cells and improve all three phases of liver detox. I use this product, in particular, with my thyroid patients. Estro-Protect uses a dual-action approach to supporting healthy estrogen-sensitive tissues. First, it provides diindolylmethane (DIM) to promote healthy estrogen metabolism and create a better balance of estrogen metabolites (2-OH, 4-OH, 16alpha-OH) through phase I cytochrome P450 enzyme induction and promotion of 2-hydroxylation. Second, the action of DIM is complemented by providing sulforaphane glucosinolate (SGS), which protects tissues from unrestrained oxidative stress and uniquely supports phase II detoxification of harmful estrogen metabolites (e.g., estrogen quinones) and xenoestrogens. As a clinician, I see so many men and women struggling with estrogen dominance and the related symptoms. This supplement gives me confidence as a practitioner that I can help these individuals get over these issues much quicker than by simply making lifestyle changes. This supplement is a key for most individuals struggling with menstrual issues, menopausal problems, endometriosis, PCOS, uterine fibroids, estrogen dominant cancers, etc. Additionally, most men with prostate cancer and/or low testosterone levels respond very well to this supplement. 3. Adams DH, Hubscher SG. Systemic Viral Infections and Collateral Damage in the Liver. The American Journal of Pathology. 2006;168(4):1057-1059. I ordered the Detox System and the ThyroLiver protect, and I already take your digestive enzymes. When I begin the Detox System, should I take any other supplements, or should I wait? I currently take a probiotic, C, D3/K2, Mag, etc. Thanks very much. If I don’t get the results I want from the Detox System, I may have to make an appointment for a consult. God bless. Yes you can take all of those supplements with the Detox system. But be sure to take the Body Detox component on its own since that has the activated charcoal in it. Hi Dr. Jockers. Thank you for the very informative approach to improving the liver. Forty percent of mynliver is fatty and I am wondering if the advice in this article is all I need to help my liver heal. If there is more could you advise? I have read that a lot of raw veggies and their juices are not recommended for people with Hashimotos. If that is true, how would I implement your suggestions to help my liver while having Hashimotos? There’s no mention of mold toxins impacting the liver. Please educate about mold toxins and their danger to our health. Funny all the other reports say that nuts are good for the over. And you say they are bad. Hi Hardy, It takes good bile flow to digest nuts. Nuts can be challenging on the body if the liver is sluggish.